The Domestic Violence Intervention Program (DVIP) offers support and advocacy services to victims and survivors of domestic abuse, stalking, dating violence, and human trafficking in eastern Iowa. DVIP was awarded a grant from Verizon Wireless’ HopeLine program to raise awareness about teen dating violence, while empowering active bystanders to speak out. 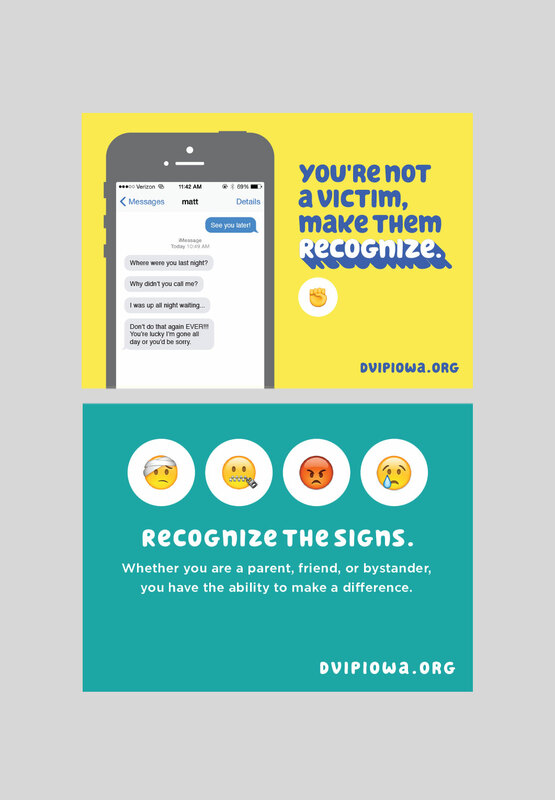 To appeal to teens, active bystanders, and parents, Creative Mellen and social media partner Sculpt helped DVIP brand and promote an awareness campaign on Facebook, Instagram, and beyond. Through national statistics and local focus groups, we realized that one barrier to preventing or stopping teen dating abuse was the lack of conversation. For victims and bystanders, recognizing the signs of abuse was also a key factor in awareness and prevention. To help promote and empower these audiences, we developed a campaign called Recognize. A word with powerful meaning for not only victims of teen dating violence, but active bystanders as well. To appeal primarily to teens and young adults, we created a graphic treatment that was playful, fun, and colorful. This simple and modern treatment was inspired and designed with social media in mind. The smooth and rounded type treatment flows with emoji’s, statistics, and photography. The shadow enhances the message to the forefront. This allowed for a flexible brand foundation to be used in print, digital, or swag. Sculpt used and expanded these brand elements throughout their social media campaign promoting education, conversation, and awareness in the Iowa City and surrounding areas.